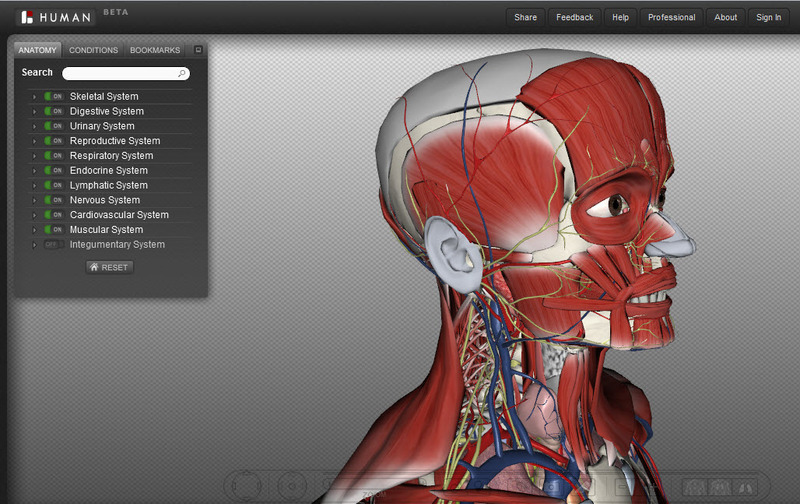 BioDigital Human is the latest in interactive, detailed maps of the human body available on the Internet. This free web tool centers around a static model of a human figure beginning with just a skeleton visible which can be rotated and scaled to view from any angle. You can control the visibility of not just the many top level systems (skeletal, digestive, nervous, cardiovascular, and many others) but also the individual components of those systems down to the individual muscles, organs, and nerves on the right and left sides. 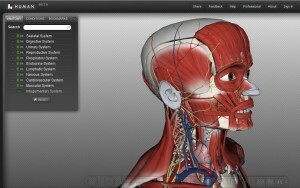 With the dissection tool you can remove just the muscles that are in your way while leaving the rest visible. Each piece can be highlighted, has a label of its full name with an audio pronunciation and an information window with links to related conditions from Medline Plus and further anatomical information from Wikipedia. A search box allows you to search for a structure by name so if you don’t remember where the pronator quadratus muscle is it quickly gives you the choice of left or right before making the muscle visible and zooming to its location. The viewer also provides tools like “dissection mode” which allows you to remove structures one at a time, delving into the body from the outside in, an “x-ray” view that shows all structures transparently allowing you to see through them to what lies beneath, and isolation view that temporarily singles out a structure you have highlighted without losing your other visible structures. Using these tools you can easily create your own personalized views with the exact choice of structures visible and angle of view. You can even “bookmark” these views for later and view bookmarks others have made public as well as take snapshots of interesting views that can be saved to your computer for later. Today the BioDigital Human tool is in a free Beta testing mode and free for anyone to use. You can find it at http://www.biodigitalhuman.com using either the Firefox or Chrome web browser.